The “Tank Man” photo has shaped the world’s memory of the Tiananmen Square crackdown of 1989 because it conveys so many themes at once. The physical courage of a lone, slightly built man standing up to an army; the act of individual protest in a society usually assumed to value collective interests over any one person; even the moral choice posed to the tank drivers, about whether to run over an unarmed fellow citizen. They didn’t—after a few minutes, other civilians hustled the Tank Man off the street and away from any effort to identify him or hear his story in all the years since. China’s censorship in those days was so thoroughgoing that the photo and the event it represented are barely known among today’s young Chinese. But the current era has produced another symbol of brave, individual moral protest, and the spread of social media means that his message and example have a better chance of surviving. 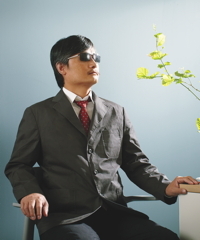 Chen, who has been blind since early childhood and taught himself law, showed physical courage comparable to the Tank Man’s in climbing over walls and feeling his way along roadsides for miles, to escape the house in which local authorities had detained and physically abused him and his family for years. He broke a bone in his foot and fell repeatedly, but he continued on. Yet his more impressive courage is intellectual and temperamental. Intellectually, he has challenged Chinese authorities, not to give up their hold on power, but instead to live up to the commitments they have made to Chinese citizens, on issues ranging from the rights of the disabled to protection against forced abortions. Temperamentally, he has remained resolute and optimistic, even while knowing that his family still in China is vulnerable to retribution, and that as an exile, he may lose influence in his homeland. “The Chinese people are more and more aware of their rights,” he told me in a recent interview. “In the past, people might hear only about their own situations. Now they know about others, and they help each other.